After releasing a teaser at the beginning of the month, Infiniti has published a revealing image with the QX30 concept. As you would expect from a concept, it rides on a set of oversized 21-inch alloy wheels with three-dimensional milled aluminum spokes that have different shades. It also benefits from roof rails flanking a glass roof, carbon fiber in the lower cladding while the rear end hosts a sculpted skid plate. 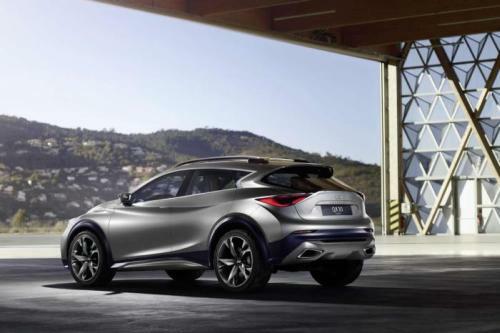 The Infiniti QX30 concept will premiere on March 3 at the Geneva Motor Show. The production versions of both concepts will be introduced in the months to come, with assembly set to take place at Nissan's factory in Sunderland.